In the heart of downtown Bloomington, near Indiana University, the urban lifestyle of Smallwood Plaza offers the ease of city living. 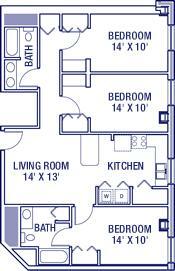 Smallwood offers a number of floor plans to accommodate your lifestyle. 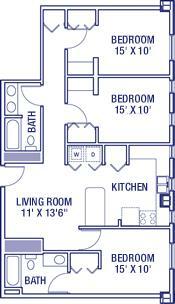 Our two-bedroom apartment, Soho, offers an open floor plan with the convenience of a private bathroom in each bedroom. Spacious living and flexibility are found in our three-bedroom apartments, Condesa and Tribeca. Smallwood residents will find the four-bedroom apartments-Columbian, Manhattan, Carnegie and Cleveland-comfortable and stylish with large kitchen areas.